Neutron stars are the smallest, densest stars in the universe, born out of the gravitational collapse of extremely massive stars. True to their name, neutron stars are composed almost entirely of neutrons—neutral subatomic particles that have been compressed into a small, incredibly dense celestial package. A new study in Nature, co-led by MIT researchers, suggests that some properties of neutron stars may be influenced not only by their multitude of densely packed neutrons, but also by a substantially smaller fraction of protons—positively charged particles that make up just 5 percent of a neutron star. Instead of gazing at the stars, the researchers came to their conclusion by analyzing the microscopic nuclei of atoms on Earth. The nucleus of an atom is packed with protons and neutrons, though not quite as densely as in neutron stars. Occasionally, if they are close enough in distance, a proton and a neutron will pair up and streak through an atom's nucleus with unusually high energy. Such "short-range correlations," as they are known, can contribute significantly to the energy balance and overall properties of a given atomic nucleus. The researchers looked for signs of proton and neutron pairs in atoms of carbon, aluminum, iron, and lead, each with a progressively higher ratio of neutrons to protons. They found that, as the relative number of neutrons in an atom increased, so did the probability that a proton would form an energetic pair. The likelihood that a neutron would pair up, however, stayed about the same. This trend suggests that, in objects with high densities of neutrons, the minority protons carry a disproportionally large part of the average energy. "We think that when you have a neutron-rich nucleus, on average, the protons move faster than the neutrons, so in some sense, protons carry the action," says study co-author Or Hen, assistant professor of physics at MIT. "We can only imagine what might happen in even more neutron-dense objects like neutron stars. Even though protons are the minority in the star, we think the minority rules. Protons seem to be very active, and we think they might determine several properties of the star." Hen and his colleagues based their study on data collected by CLAS—the CEBAF (Continuous Electron Beam Accelerator Facility) Large Acceptance Spectrometer, a particle accelerator and detector based at Jefferson Laboratory in Virginia. CLAS, which operated from 1998 to 2012, was designed to detect and record the multiple particles that are emitted when beams of electrons impinge on atomic targets. "Having this property of a detector that sees everything and also keeps everything for offline analysis is extremely rare," Hen says. "It even has kept what people considered 'noise,' and we're now learning that one person's noise is another person's signal." The team chose to mine CLAF's archived data for signs of short-range correlations—interactions that the detector was not necessarily meant to produce, but that it captured nonetheless. "People were using the detector to look at specific interactions, but meanwhile, it also measured in parallel a bunch of other reactions that took place," says collaborator Larry Weinstein, a professor of physics at Old Dominion University. "So we thought, 'Let's dig into this data and see if there's anything interesting there.' We want to squeeze as much science as we can out of experiments that have already run." 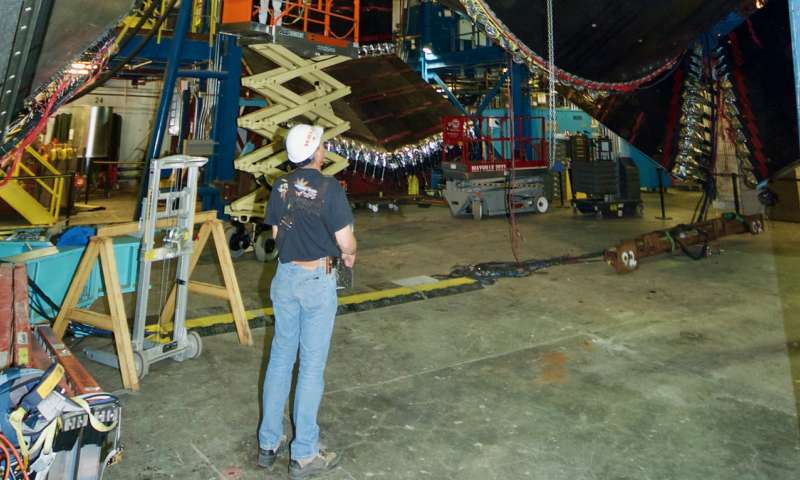 The team chose to mine CLAS data collected in 2004, during an experiment in which the detector aimed beams of electrons at carbon, aluminum, iron, and lead atoms, with the goal of observing how particles produced in nuclear interactions travel through each atom's respectively larger volume. Along with their varying sizes, each of the four types of atoms have different ratios of neutrons to protons in their nuclei, with carbon having the fewest neutrons and lead having the most. The reanalysis of the data was done by graduate student Meytal Duer from Tel Aviv University in a collaboration with MIT and Old Dominion University, and was led by Hen. The overall study was conducted by an international consortium called the CLAS Collaboration, made up of 182 members from 42 institutions in 9 countries. The group studied the data for signs of high-energy protons and neutrons—indications that the particles had paired up—and whether the probability of this pairing changed as the ratio of neutrons to protons increased. "We wanted to start from a symmetric nucleus and see, as we add more neutrons, how things evolve," Hen says. "We would never get to the symmetries of neutron stars here on Earth, but we could at least see some trend and understand from that, what could be going on in the star." In the end, the team observed that as the number of neutrons in an atom's nucleus increased, the probability of protons having high energies (and having paired up with a neutron) also increased significantly, while the same probability for neutrons remained the same. "The analogy we like to give is that it's like going to a dance party," Hen says, invoking a scenario in which boys who might pair up with girls on the dance floor are vastly outnumbered. "What would happen is, the average boy would ... dance a lot more, so even though they were a minority in the party, the boys, like the protons, would be extremely active." Hen says this trend of energetic protons in neutron-rich atoms may extend to even more neutron-dense objects, such as neutron stars. The role of protons in these extreme objects may then be more significant than people previously suspected. This revelation, Hen says, may shake up scientists' understanding of how neutron stars behave. For instance, as protons may carry substantially more energy than previously thought, they may contribute to properties of a neutron star such as its stiffness, its ratio of mass to size, and its process of cooling. "All these properties then affect how two neutron stars merge together, which we think is one of the main processes in the universe that create nuclei heavier than iron, such as gold," Hen says. "Now that we know the small fraction of protons in the star are very highly correlated, we will have to rethink how [neutron stars] behave." how do some protrons withstand the gravity, and not colapse? Elementary particles are not subject to "collapse", a proton is an elementary particle. A proton is an elementary particle? Ha ha haaa. Benni, your unknowledge astounds me once again. Especially your unknowledge about nuclear physics. What is your occupation again? Actually a proton consists of three quarks, two up quarks and a down quark. Quarks have NEVER been ISOLATED. Evidence of their existence is theorized ONLY INDIRECTLY from the observed patterns of mesons and baryons that are produced in high energy accelerators, in essence they are VIRTUAL particles never having been observed. Certain particles seen in LHC experiments are conveniently explained in terms of quarks, but Gell-Mann originally did not think the quark was actually a particle in its own right. If something cannot be isolated as an individual particle, can it truly be an elementary particle? No. Ojo, why do you keep trying these Pop-Cosmology Fantasies? You know I'm gonna catch you & all you will end up doing is going on another Pop-Cosmology name calling rant. Hey Ojo, if you think a proton is not an elementary particle maybe you can tell us what the half-life of a proton is? You know, something like the way you guys suffering Pop-Cosmology Derangement Syndrome explain free neutron half-life? Quarks have NEVER been ISOLATED. That is because a quark, if it exists, cannot exist by itself i.e. without another quark. Evidence of their existence is theorized ONLY INDIRECTLY from the observed patterns. Many things are "ONLY INDIRECTLY" observed. So what? Black holes as well as protons are "ONLY INDIRECTLY" observed and yet it is a scientific fact they exist. No one has ever see either directly but rather only seen them indirectly; so they cannot exist? In science, indirect observation is just as valid as direct observation; why not? You don't appear to understand how science works. if you think a proton is not an elementary particle maybe you can tell us what the half-life of a proton is? You know, something like the way you guys suffering Pop-Cosmology Derangement Syndrome explain free neutron half-life? Wiki says it is "about 14 minutes, 42 seconds". Physics explains the half-life. So what? Your point? A half-life of a proton has been theorized but without proof and physics has yet to tell us what, if any, is the half-life of a proton. So what? "In particle physics, an elementary particle or fundamental particle is a subatomic particle with no substructure, thus not composed of other particles." Well, no mention or hint of "half-life" there! .......that's a moniker of yourself. Have you ever noticed that EVERYTHING pushed as "science" in the fantasyland of Pop-Cosmology can NEVER be directly observed? OK, you want to be the responding genius here, tell us what the half life of a proton is if you think it isn't an elementary particle? No Pop-Cosmology genius, you just quoted the beta decay rate of a free neutron & mistakenly confused that with radioactive half life. Ok, so now we know you think a neutron has a radioactive half-life decay rate......so describe for us what composes the mass of half a neutron? I guess you think it must be something like that of half a proton, half an electron, & half an anti-neutrino? Then when the neutron has finished it's 15 minute decay rate all those half particles just become full blown WHOLE particles is that it, things just sort of change & grow over the course of 15 minutes. Mr Pop-Cosmology genius, I'd suggest you go back to your vaunted physics book & learn the difference between HALF- LIFE RADIOACTIVE DECAY and that of BETA DECAY, because clearly you have no comprehension of nuclear physics like I do, you're a fish out of water here. So the observation of gravitational lensing from black holes isn't an "observation" because it doesn't directly observe the black hole? The light and sound you sense you do so indirectly because your brain doesn't sense them directly but rather only after they have been converted and represented as electrical impulses that then have to travel to your brain. Thus, in that narrow sense, ALL observations are 'indirect'. With your logic then, we should dismiss all observations. 1, NOBODY KNOWS if it has a half-life. 2, whether it has a half-like is irrelevant to whether its an elementary particle. I can show links to backup both the above assertions. Ok, so now we know you think a neutron has a radioactive half-life decay rate......so describe for us what composes the mass of half a neutron? . I very clearly didn't say/imply any of what you implied I said above. What are you on? have you noticed that the more evidence you present, the more (s)he denies it and the more (s)he degrades anyone who doesn't believe like (s)he does? Before you go any further, you'd do better by learning the differences between Radio-Active Decay & Beta Decay, because when you clearly don't understand those two differences all you are doing is wandering around out in the weeds. I very clearly didn't say/imply any of what you implied I said above. Wiki says it is "about 14 minutes, 42 seconds"
Why is so puzzling to you Pop-Cosmology aficionados why truly educated people think of your kind of reasoning as nothing less than funny farm stuff. Benni knows nothing about nuclear physics but is one of the most successful trolls on phys.org. Why don't you all just ignore it? OK, One error; I said "half-life" when I meant "mean lifetime", a verbal mistake but I know the difference. So where did I imply there that it splits into something that is half the mass of a neutron? I obviously already know the difference. What of it? What has that got to do with what is an elementary particle? .......and you don't cease from screwing it up, A FREE NEUTRON does not have a "mean lifetime" either, you read too much WkiiPedia written up by Pop-Cosmologists as clueless as you are about something that is very basic nuclear physics. I obviously already know the difference. No, obviously" you don't, I've just been teaching it to you for the first time in your life. What of it? What has that got to do with what is an elementary particle? A proton does not decay. Proving you still do not comprehend the difference between Half-Life Radio-active Decay & Beta Decay, otherwise you wouldn't even ask the question. When an atomic mass undergoes Radio-Active Decay, it's lifetime is measured in HALF-LIFE via which over a specified period of time it loses 1/2 it's initial mass. A FREE NEUTRON is not an atomic mass that undergoes 1/2 life decay because it is not an atomic mass, and therefore restricted to Beta Decay. But you still want to insist a NEUTRON has a half-life (mean) decay rate. According to YOUR new definition of Beta Decay, the "mean, half-life" of a neutron is 15/2=7.5 minutes. By your concept of neutron decay half-life, it can only mean half of the neutron has decayed in 7.5 minutes. OK so tell us, what's left of the original neutron according to your redefinition of Beta Decay rate of a neutron? What are the emission particles? Electrons and neutrinos are spontaneously created, they have no half life! Beta decay is where an energetic electron or positron and a neutrino are emitted from an atomic nucleus. Beta decay of a neutron transforms it into a proton by the emission of an electron, or conversely a proton is converted into a neutron by the emission of a positron, changing the nuclide type. Neither the beta particle nor its associated neutrino exist within the nucleus prior to beta decay, but are created in the decay process. As neither the beta particle nor its associated neutrino exist within the nucleus prior to beta decay they are spontaneously created, the electron, positron, neutrino, antineutrino do not have a half life as they are spontaneously created a proton spontaneously decays to neutron. Where as a neutron spontaneously decays to a proton! Yeah, free neutron decay is spontaneous. Spontaneous decay is not measured in half-life, mean-life, or whatever Pop-Cosmology thinks it can dream up to circumvent immutable laws of nuclear physics. Electron capture and the photo-electric effect occur spontaneously. The reverse of beta decay where the nuclear process, mediated by the weak force in electron capture, an inner atomic electron is captured by one of the protons in the nucleus, transforming it into a neutron, and an electron neutrino is released. The process of absorbing an inner electron spontaneously releases an electron neutrino and spontaneously releases a neutron. The atoms electrons absorbing photons increase the energy of the electron where by the atom spontaneously releases that electron when that electron exceeds the thresh hold energy required. The key fact is spontaneity – atomic processes that involve electrons and neutrinos always occur spontaneously – there is no half-life. Electrons and neutrinos are elemental indivisible particles and consequently have no half-life. Ok Benni, I get it, you don't believe in Pop-Cosmology or Pop-Anything. "...Outside the nucleus, free neutrons are unstable and have a mean lifetime of 881.5±1.5 s (about 14 minutes, 42 seconds). Therefore, the half-life for this process (which differs from the mean lifetime by a factor of ln(2) ≈ 0.693) is 611±1 s (about 10 minutes, 11 seconds)...."
That is its MEAN AVERAGE lifetime, NOT the lifetime of each muon! Some will decay well before that and some well after that. c is NOT a distance but rather a SPEED. So saying "a distance equal to light" is gibberish. Don't know what you are talking about here as that makes no sense whatsoever. You are obviously very confused. "...The muons from these high energy cosmic rays generally continue in about the same direction as the original proton, at a velocity near the speed of light. Although their lifetime without relativistic effects would allow a half-survival distance of only about 456 m (2.197 µs×ln(2) × 0.9997×c) at most (as seen from Earth) the time dilation effect of special relativity (from the viewpoint of the Earth) allows cosmic ray secondary muons to survive the flight to the Earth's surface, since in the Earth frame, the muons have a longer half life due to their velocity. .."
"...The decay of muons has provided verification of Einstein's formula to a high degree of accuracy...."
In other words, the observed muon decay rate CONFIRMS relativity, NOT contradicts it. So that is evidence FOR relativity, NOT against it. The muon decay rate doesn't present a problem for relativity but rather conformation of it. Albert Einstein is correct on length contraction. This is not a fruitless discussion into the semantics of half life. The muon in 2.2x10-6s cross's a distance equal to light, but its life time is too short for this to be so. A half life by its very variable nature gives the muon a variability in its life span such that it could decay instantly or in 2.2x10-6s or in 60s or whatever variation is possible in a the variability of a half life. Therefore a muon does not have a half life. It doesn't matter one iota what your favorite Pop-Cosmology source speculates about neutron decay rates(s). If the LHC created 10 trillion free neutrons at the same exact instant in time, ALL 10 trillion of those neutrons will spontaneously decay at EXACTLY the same instant in time, there will be no AVERAGE, MEAN, or 1/2 Life Decay Rate, or any other fantasy Pop-Cosmology wants to dream up in all it's foolishness to circumvent an Immutable Law of Nuclear Physics. The reason Pop-Cosmology is so obstinate about free neutron decay rate, is because of the need to support the theory of black hole formation, the underpinnings of which are neutron stars. BH theory starts with free neutron star formation & therefore the need for negating free neutron decay. > granDy: What? What is it that "absorbs an inner electron"? A proton having an orbital electron? An electron capture event of some kind? It would be far more efficient in terms of conservation of energy that an electron within any proximity of a proton will form the most common element in the Universe, hydrogen (H1), NEVER a neutron. What forces of events would you propose that would cause neutrons to be created from H1? Such an electron capture event has never been observed in the LHC that I've ever read anything about. How many times must I repeat myself before your finally get it? c is NOT A DISTANCE. There isn't such thing as "a distance equal to light" because that is just gibberish. Thus your statement of "The muon in 2.2x10-6s cross's a distance equal to light", along with the rest of your assertions (but for various other different reasons), is just gibberish. You can only have something that is "a SPEED equal to (that of) light", NOT its 'distance'. OK, tell us all what is this "distance" of light... I want you to give us a specific real number in metres and then tell us where you got that from. Too thick for words! Get back to us when you've finished grade school, dumbo. I want to support humy's repudiation of the complete BS you keep posting with regards to this nuclear physics. from the mean lifetime by a factor of ln(2) ≈ 0.693) is 611±1 s (about 10 minutes, 11 seconds)." Clearly, free neutrons DO have a mean life-time/half-life. Any science text book would tell you the same thing. Your ludicrous claim that you understand this simple nuclear physics better than the knowledgeable people you are arguing with is therefore utterly disproved. Indeed. The problem with these cranks is that they are, more often than not, too stupid to realise how stupid they are. Yep! This is the Dunning–Kruger effect that some other posters here have mentioned, particularly with respect to this idiot. Electron capture; The reverse of beta decay where the nuclear process, mediated by the weak force in electron capture, an inner atomic electron is captured by one of the protons in the nucleus, transforming it into a neutron, and an electron neutrino is released. What is your interpretation of the electron capture event, assuming it does occur because the vibes I am now sensing I am getting the impression reverse beta-decay is a nonentity? an electron within any proximity of a proton will form the most common element in the Universe, hydrogen (H1), NEVER a neutron. Electron capture is rare, only occurring among heavier elements in forming neutrons in the manner you have described. The idea that neutrons thus formed are somehow free to forever wander the Universe & form Neutron Stars is negated by the 15 minute decay rate which simply begins the decay rate cycle all over again unless that newly formed neutron immediately binds to form a nucleus with a proton and an orbital electron to form H2. No, the reason being that you are reading Pop-Cosmology psychobabble that does not know the frame of reference when inserting "half-life" into this unintelligible use of the term "half-life". You of course like it because it gives those of you afflicted with Pop-Cosmology Derangement Syndrome a bit of semantic wiggle room for creating scenarios whereby "free neutron half-life" can extend the 15 minute decay beyond 15 minutes to a decay rate that can last for billions of years just so Pop-Cosmology can have it's neutron stars. Of course you know it is claimed neutron stars are almost completely composed of "free neutrons"? Or maybe you didn't? Why are you always right Benni! granville> What is your interpretation of the electron capture event, ? Benni> an electron within any proximity of a proton will form the most common element in the Universe, hydrogen (H1), NEVER a neutron. Electron capture is rare, only occurring among heavier elements in forming neutrons in the manner you have described. The idea that neutrons thus formed are somehow free to forever wander the Universe & form Neutron Stars is negated by the 15 minute decay rate which simply begins the decay rate cycle all over again unless that newly formed neutron immediately binds to form a nucleus with a proton and an orbital electron to form H2. Just reread it Benni, you appear to be right again, it says "is a process in which the proton-rich nucleus of an electrically neutral atom absorbs an inner atomic electron" which implies the heavier elements. Is a text book actual experimental proof? I personally am not overly concerned with immediate experimental data because I can find it out later. But in this case as Benni has been persistently pursued on this text book half life by others and your good self RNP, it is onerous on you to prove by pointing to experimental written data a neutron has a half life by the full meaning of the definition of a half life! Without appearing to be rude RNP, as the saying goes - put up or shut up! You two are simply jealous. You wished your lifestyle could be scrutinized so intently that it would make others scream with jealousy. Oh, by the way, over the weekend I used a chainsaw to cut apart a huge pine tree that uprooted over this past winter. That sucker was huge & the chainsaw I used to cut apart the massive trunk had a 24" bar on it & was as heavy as some of the 50 pound logs I was cutting. Then I had to throw those 50 pound logs into the bed of my pickup for hauling to my burn pit a thousand feet away, then pitch them back out again. This coming weekend we're gonna have a nice party around the burn pit with some of my colleagues dancing around the fire. I'll be picking my guitar to the sounds of Rocky Mountain High, The Mountain Song & some other JD classics. Maybe a bald eagle will fly low enough to join the party. Oh, by the way, over the weekend I used a chainsaw to cut apart a huge pine tree that uprooted over this past winter. Benni do rub it in, life is grim up north in those lancashire mill towns ! Is this where you found out jonesy & RNP live? Gosh, on the rural road I live on horses almost outnumber the people. And talking of horse's Benni, Cambridge is a stone's throw from the Sport of Kings, Newmarket Benni. Those sleek multimillion £££ racehorses are stabled in multimillion £££ stables throughout Newmarket and the surrounding country side they have the town specially for these sleek horse's their own crossings as the trot in long lines through the town - they have those rich oil sheiks by their glossy tails literally fawning over them in admiration pandering to their every whim Benni and when you see the foals they are creatures to behold, their pedigree is destined for The Sport of Kings. Humy, concerning the comprehensions of the subtitles of the English Language, as spoken from birth and not from a textural grammar school book approach. Take "The muon in 2.2x10-6s cross's a distance equal to light" in this statement is T time and V velocity where in this instance velocity is the speed of light, i.e. 299792458m/s. Now pray Humy, what is it that you cannot understand concerning the statement "The muon in 2.2x10-6s cross's a distance equal to light" in the context in whence it is used in my full comment. Humy, this is another of your pointless circular arguments, because specifically in this case, the infamous muon:- The muon in 2.2x10-6s cross's a distance equal to light where it is one of those distance's humy that is an undisputed distance humy, from the upper atmosphere to the ground humy. 2.2x10-6s multiplied by the speed of light is 659.5m humy or in round figures 660m. I think you will find that is the reason why the muon is infamous Humy, The muon in 2.2x10-6s cross's a distance equal to light where the distance is the edge of space not 660m as you well know Humy. Another of your circular arguments humy! And now to top it all, the circular arguments have got at the subtitles of the English Language. Where it should read the Subtleties of the English Language! Benni once again conversing with his sock puppet and guess what they agree with each other. .........and the most dead-end circular argument that has shown up in all these discussions about NEUTRON DECAY is when responders living inside the bubble of Pop Cosmology attempt to assert that the 15 minute decay rate of a free neutron is subject to the half-life of radio-active decay. These uneducated neophytes simply have no comprehension of the differences between the two DECAY processes because not a one of them has ever cracked the covers of a nuclear physics textbook in a college classroom, studied the course, taken the final exam & gotten a grade, so they just come here throwing expletives around all over the place & somehow imagining that makes up for their lack of education. ......... Pop Cosmology attempt[s] to assert that the 15 minute decay rate of a free neutron is subject to the half-life of radio-active decay. ever cracked the covers of a nuclear physics textbook in a college classroom, studied the course, taken the final exam & gotten a grade..
Well, YOU *certainly* have not! Let me give you a quote from a site providing information about nuclear power ( https://www.nucle...utron/). A free neutron will decay with a half-life of about 611 seconds (10.3 minutes)." Clearly this is not "Pop Cosmology", but real nuclear physics. Hey, mister freelance journalist, as a professional actually working in the field of Nuclear/Electrical Engineering, I know better than to fall for these kinds of cherry picked statements. So I'll just ask you again, "What is the composition of half a neutron at 10.3 minutes? I've only asked you Pop-Cosmology neophytes this question dozens of times & have yet to get an answer to the above question? The fact of the matter is, everytime you Pop-Cosmology aficionados see this WRONG statement, you glom onto to it in hopes it leads to something that extends the decay rate of a neutron for billions of years beyonf 15 minutes. .....What is the composition of half a neutron at 10.3 minutes? You really are an idiot, aren't you? We ALL know that there is no such thing as "half a neutron". How deluded must you be to even conceive of such a silly idea? You have obviously not understood what "half-life" means. A single neutron can decay almost intananeously, or survive for many hours. The AVERAGE (of ~15 min) that you keep quoting, is the result of a half-life just over 10 minutes. The neutron does not exist in nature in its free state. Quote your fantasy source for this absolutely nonsensical statement. Or is it just another one of those funny farm cosmology things you freelance journalists like to bat around on an empty news day? "A free neutron will decay with a half-life of about 611 seconds (10.3 minutes). This decay involves the weak interaction and is associated with a quark transformation (a down quark is converted to an up quark). " > granDy: I quoted the rest of it above from the link you provided. That whole concept of 10.3 minutes half life is based on a premise that quarks actually exist. A quark particle has NEVER been isolated & is what is better known as a VIRTUAL PARTICLE, in other words one of those unreal things science often refers to as PLACEHOLDERS. Again, too thick for words! Give it a few years, until you are at university, dear, and then get back to us. Dummy. Jesus H. Christ! The stupid in that statement is unbelievable, and could only have been written by somebody who never attended High School. Half a neutron? Dear God, what a wazzock. Answer to what, you prawn? If you have a number of neutrons, they will decay to protons etc, with a half-life of ~ 10 mins. If you have one frigging neutron, it is not going to turn into half a neutron, you moron. One neutron has a probability of decaying within its half-life of roughly 50:50, It might, or it might not. It might decay earlier, it might decay later. This is high school physics, loony tunes. What is the half-life of C-14? What is the probability of a single atom of C-14 decaying within that time? Mate, go to school, yes? hey! Maybe this is something he figured out with all his differential equation maths knowledge! Oh Christ! I haven't read the link, but from memory the change in the Earth's rotational axis is measured over roughly 20 000 years. Also from memory, the Sun orbits the galactic centre every ~ 250m years. Yep, has to be a correlation! Only if one is stupid, though. Why, because they only exist in pairs as they do not exist in isolation, the epitome of Obfuscation seems to be the scientific method of proving your theory, they exist but not in isolation as they decay in isolation so consequently non have been observed. ^^^^^Got a scientific hypothesis, Granny? Go write it up, instead of wasting pixels on here, yes? What exactly are you qualified in? Obviously not English, but which science subjects did you cover at Uni? Free neutrons (which do not apply in neutron stars, due to degeneracy) have a half-life. They also have a mean lifetime. It isn't rocket science. In fact, it is High School science. Now, is anybody struggling with that? Not everybody has attended High School physics lessons, let alone been to university. Don't be shy; there are plenty of people prepared to help you with your homework here. Does this not have an air of déjà vu? Sure, and you see what the neophytes above are trying to present as an argument for a 10.3 minute neutron half life is based solely on three virtual particles in a neutron & three in a proton, that these never isolated particles must function exactly in the manner they claim. The 10.3 minutes of their quark theory is never reflected in the outcome of neutron decay rate & therefore has no effect on that rate, this simply because the 10.3 is an assumed quantity that materially has no bearing on the 15 minute decay rate of a real particle, the neutron. jonesy has stated in past Comments that his course of study was anthropology. A mathless discipline of study that makes it self-explanatory as to why this guy spends so much time wandering around in a field of weeds with never so much as a single cogent thought when it comes to nuclear physics, or any other kind of physics. Why is the the Five Star Club so het up on no free neutrons in the vacuum? You bet, isn't it just so puzzling that all they want to talk about are those 611 secs, wagging that around as if it were some kind of magical wand that changes the beta decay outcome of a neutron. I'd be interested in reading how they claim those 611 secs prevents a free neutron from decaying in 15 minutes to one that can last billions of years to form neutron stars. So come on RNP, jonesy, etc. as neutrons only don't decay with protons there is no concevable reason why neutrons incombination are imune from decaying is there experimental proof of neutrons decaying in contact? By the time this is done you will be able to present your study of the anthropological male under stress of neutron decay to the anthropological society Benni. Explain the nuclear physics behind this vaunted "degeneracy"? When has it been observed in the LHC? Neutrons have no electric field how are they accelerated in the LHC and a magnetic field is required to guide them throuhg the magnets. This is the reason protons are used as the bullets, I'm just trying to see if jonesy can pick up on my intentions of tripping him into another muddy hole & YOU spoiled it granDy. I'm gonna start spelling you with all capital letters, because everytime I come up with a foolproof question of tripping up the 611 brigade you keep coming up with the RIGHT answers before I can trick them into giving the usual WRONG answers. Now I need to come up with a different way of tricking them into giving the wrong answers, you know the ones they think are the right ones. Were back to when the star explodes and the nucli are in free fall the proton with stands pressure why they wiill they combine into neutrons does the proton in collision in the LHC combine with the neutron? Damn it GRANDY, you did it again. OK, I carried through on my threat, now give jonesy & RNP the space & time to come up with the usual deranged Pop-Cosmology psycho-babble to my questions. I know it's hard holding back to provide the CORRECT responses isn't it. Well, okay then I forgive you & maybe will return to the single capital D so you won't feel offended when I accuse you of jumping to the front of the line. You just answered your own question. A proton bound up in a neutron is certainly not an available bullet is it? I can't definitively answer either of these two questions. Stars are a much less controlled enironment than the LHC where protons are the exclusive bullets. Neutrons are used in the fission process in nuclear reactors for splitting an atom but this is far different than the LHC accelerator, so it seems it would depend on the local environment as to how energy within a star is being created. It's from the team leading the world's most sensitive neutron decay experiment. See the graph, it shows the decay curve for a batch of free neutrons, 17 repeat runs over 2.5 days. and therefore directly measure the decay curve. Look, there's free neutrons decaying at 3 minutes all the way to 46 minutes. But...but Benni said all neutrons decay at exactly the same time! Yes, Benni did say that but Benni was wrong, as everyone kept saying. The data from the world's leading experts proves it. via the email address on that web page. It's all a matter of where on the time curve an already existing neutron was detected which has zero to do with the KNOWN rate of decay of a free neutron at 14.7 minutes. If the presence of the neutron is not detected until it is already 12 minutes into it's decay cycle, then of course it's remaining decay time will be measured at 3 minutes beyond that. Love the 46 minute fantasy. No free neutron has ever been recorded taking 46 minutes to decay & it's not known in the LHC no matter how you try to statistically manipulate the data which is all your precious graph does. It is IMMUTABLE that a free neutron decays in just about 14.7 minutes. So what about the 46 minute statistical extrapolation, how does that get you to a neutron star in which neutrons supposedly exist in the free unbound state for billions of years? Or did you just simply forget that billions of years exceeds 46 minutes? Benni, it's over. You're wrong. The data shows your wrong. There's nowhere left to run or hide. If you can't accept that that's your problem, no one else's. Anyone reading this can go to that site and see it for themselves or even contact the scientists directly. By all means keep on crying if you want, your tears are delicious. "Neutron stars are supported against further collapse by neutron degeneracy pressure, just as white dwarfs are supported against collapse by electron degeneracy pressure"
Neutrons or proton equally withstand 10x the force exerted on a neutron star, but by protons converting to neutrons - do not protons have electric and magnetic fields where as neutrons have neither as does not a neutron star have a magnetic field? Where is this magnetic field emanating because presumably it is not from the neutrons? This of course is ignoring the little fact a neutron is so called because it is electrically neutral and has no magnetic field. Neutrons have a magnetic moment which results from the imbalance of the distribution of the electric charges of the constituent quarks (one up and two down). With high densities of neutrons in a neutron star and no mechanism that prevents these magnetic dipoles to align you can get a huge resultant magnetic field. Shortly after the big bang temperatures and densities were high and you get a quark gluon plasma. After expansion/cooling neutrons can form just fine when the correct number/types of quarks pair up. No prior electron/proton needed. This thing with feet has to end. .......this can only mean neutron stars don't exist. If one neutron doesn't have a magnetic field, there's no way a quadrillion can have a magnetic field & therefore neutron stars don't exist. By the way, how do you get a stable mass of free neutrons that can last for only 15 minutes in time? Maybe you too have a quark theory? I mean, what the hell, we already know Pop-Cosmology is based on fantasy just like quarks are, so what the hell's the difference if it creates another fantasy just to see how many suckers exist to swallow it, like anti-al. antialias_physorg> Neutrons have a magnetic moment which results from the imbalance of the distribution of the electric charges of the constituent quarks (one up and two down). When do you get it about "quarks"? A quark has never been isolated as proof of it's existence, it is simply another one of those mathematically created MODELS used as a placeholder to cover other unexplained datasets. "quarks internally orbit 1up and 2down, where the 2down occupy a greater area than the 1up creating an imbalance that all though electrically quasi neutral, they are in their efforts to remain stable in orbit creating a residual negative charge". How do you know quarks ORBIT anything? If it can't be isolated, how can you possibly know? "A quark has never been isolated as proof of it's existence"
Atoms have a philosophy - smaller and smaller when found, there are particles even smaller, where each particle is smaller than a proton and cannot be seen except in the proton as point like sub particles which apparently have not been reproduced in isolation. There could be various reasons for this; they might not exist in isolation. Neutrons are not 100% electrically neutral, they have a miniscule electric charge which is indicative of a negative charge made up of differing fractional charges within the neutron which for want of a better name, we are calling the quarks. Once we enter inside this theoretical quark, a whole sub-quark world will emerge analogues to the atomic world we presently observe. In other words nobody had observed the earth as sphere, there for it was flat. ...........and from this hodge podge of virtual particles you imagine other types atoms inside of atoms? Then somehow from this you dream up a pathway to a free unbound neutron that can become stable enough to exist beyond the immutable decay rate of 15 minutes, for like billions of years? C'mon, get real here. Pop-Cosmology is 100% immersed in so much funny farm pseudo-science that it's little different from reading a science fiction novel. Problem is, they are seen to exist, dumbo, or haven't you been keeping up with the LIGO results? You may also need to read up on a chap called Pauli. "from this hodge podge of virtual particles you imagine other types atoms inside of atoms"
There has to be flexibility in approaching argumentative points of discussion, because if the intention is to succeed by the number of points scored, if you place your dogma "in it has not been observed there for it does not exist" you become a follower of the now debunked flat earth society and all that follows as the loser of the points of discussion. There are undeniably particles inside the proton, what exactly is still theoretical. Because it is undeniable, the proton is not the be all and end all, in the atomic world the neutron is also not the be all and end all. There is something inside the neutron which concerning yours points cannot be ignored. Unless a proton can be OBSERVED to decay, the theory thus falls apart if you can't prove a proton IS NOT an elementary particle. Can you prove the proton IS NOT an ELEMENTARY particle? When has the decay of a proton been observed in the manner in which the decay of a neutron can be observed? Can't cite such a decay can you? And if you can't observe the decay of a proton there is no way to conclude it is made up of even smaller particles, namely quarks. Can you prove the proton IS NOT an ELEMENTARY particle? It has already been proven, if you understood particle physics you'd know that. Your problem is you know so little of the basics, it's impossible to explain anything to you, it just flies right over your empty head.